Affordable Lobster in Las Vegas? Pop a lobster tail on a stick and you pretty much can forget all your worries. One hand on the lobster and the other hand to fend off anyone who attempts to come in for a taste. At Lobster ME they also have lobster ice cream but should we not draw a line as to how much lobster we should have in our meal? Oh, well, then you can have some lobster ceviche, lobster shooters to go along with your lobster roll. Lobster ME has two convenient locations at the Planet Hollywood Miracle Mile Shops and the Venetian Las Vegas food court. This is not exactly cheap food but it is good food for a very affordable price. You can't get a better deal on lobster anywhere else on the Las Vegas strip. Price Range at Lobster ME Las Vegas: Just above cheap but not yet moderate. A roll might cost you just under $25 but it does have lobster in it. This is not like buying a California roll with imitation crab in it, this is real lobster. Hours at Lobster ME Las Vegas: Open daily. From 9 am – 11 pm. This is the real deal when it comes to craving lobster. Just the basics are needed to fulfill your craving. It’s not exactly like you pulled up to the dock in your beat up pick-up truck but it is that casual. Lobster ME is a simple counter with a few tables and some very friendly people to help you through the menu. This is not a date night spot unless your date appreciates a place that gets to the point and doesn’t waste time. Casual, relaxed and affordable by Las Vegas standards. As for the food, how can you question the idea of lobster? You get a simple menu with some flavorful lobster dishes that do not have that ambiguous “market price” label right beside it. 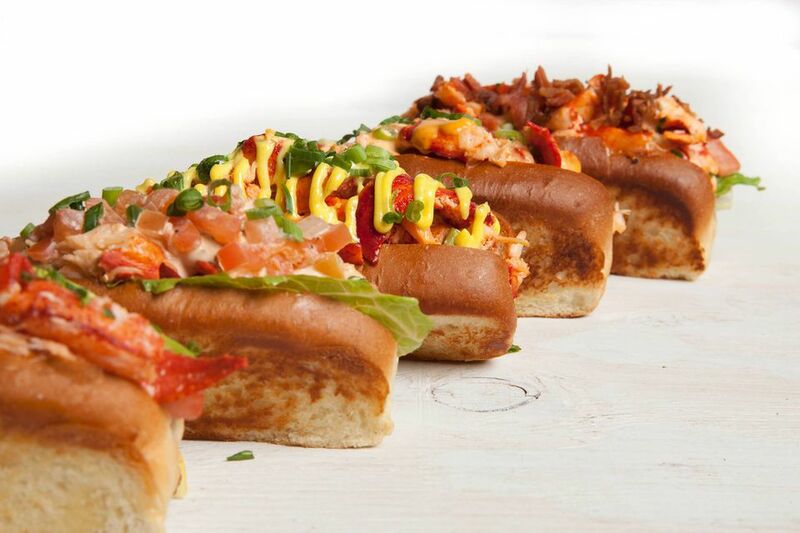 World’s Best Lobster Roll – (Their words) – It is a good lobster roll and a decent buy considering how much lobster you get. If you've tried every lobster roll in the world you might not think this is the very best. However, the research team at Lobster ME did some serious research and they stand by their claim. The buttered brioche snuggles up against an ample portion of lobster that is the right amount of buttery sweet and then it’s accented with some lemon mayo butter. Soft bread and warm lobster is so very comfortable. Grab the larger roll if you are sharing with someone. Lobster Mac & Cheese – You’ll find this up and down the strip and some fancy chef will drop in some truffles or just truffle oil and charge you way too much for it. This is a healthy portion and priced right. Lobster Grilled Cheese – Whatever you do do not feed this to your kids. You can’t afford this type of craving. It’s buttery, it’s cheesy it’s exactly why you learned to use a griddle when you were 9 and you needed that after-school snack.